¿Qué tenemos que hacer? Sólo hacernos seguidores en Facebook de Synology y subir una foto de nuestra NAS Synology con el nombre que le hemos dado (deberemos indicarlo en el campo "Description" en el momento de subir la imagen. Las dos fotos que reiban más votos se llevarán los dos primeros premios, dejándose el tercero para ser sorteado entre todos los participantes. Interesante concurso, no? What did you name your DiskStation? Snap a picture of your DiskStation and share it’s name with us to enter to win! Don't have a DiskStation yet? Learn more about DiskStations here, then be sure to vote for your favorite name so you will be entered to win as well. The name with the most votes will win a DS413j. Second place will win a DS213j. The third prize will be a random drawing of all those that have voted – get your friends to vote and they’ll be entered to win as well! 1. First Place: DS413j aka "BeeBot"
2. Second Place: DS213j aka "Data-myster"
3. Third Place: DS213j aka "Sky-sync"
3. Get your friends to vote for your DiskStation's name as the "Best"
- One entree per person. - Fake accounts will be banned. - Top 2 winners with the most votes will win. First Prize is the DS413j, Second winner will get the DS213j. - We will randomly choose 3rd prize winner among the voters. - Voting ends when contest ends. 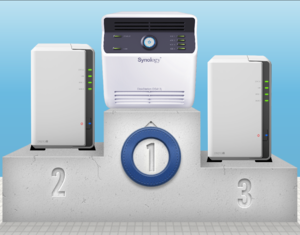 - We reserve the right to use your entree (picture and name of DiskStation) for marketing use on, including but not limited to Synology.com, Facebook, and printed materials, even after contest has ended. Nada, que voy a vestir a mi NAS de faralaes y ya veras lo guapeton que me queda... a ver si le pillo un compañero que esta mu solito el pobre y tiene casi llenos ambos dos discos jejeee. Otro Synology le vendria TAN BIEN... ains!!! Eh, me has quitado la idea, exijo la mitad del espacio de esa NAS si te toca!